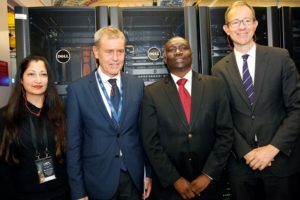 South African Council for Scientific and Industrial Research (CSIR) Program Director Kagiso Chikane recently welcomed 100 guests to the Centre for High Performance Computing (CHPC) in Cape Town for the dedication of the fastest computer on the African continent. 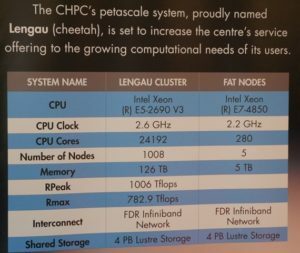 “Lengau,” which means “Cheetah” in the African Setswana language, ranked 121 on the June Top 500 list of the world’s fastest supercomputers. However, none hold a candle to Lengau’s potential when it comes to solving the world’s grand challenges that are deeply rooted in Mother Africa. 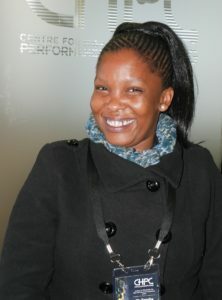 Meintjes credited CHPC Director Happy Sithole’s vision and leadership. “He knew that to out-compute, is to out-compete. 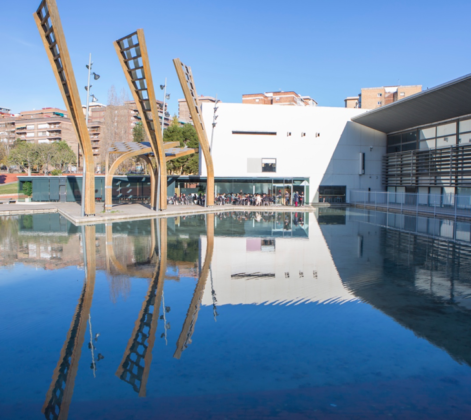 However, it’s not easy to build and sustain a business case for HPC when there are many urgent and competing priorities for limited public funds. In that regard, Lengau became a reality against the odds,” he said. Meintjes also recognized CHPC Technical Director Dorah Thobye for having provided steadfast leadership of the Cape Town team that built a system everyone can be proud of. “Lengau was built by South Africans, for South Africa,” he said. 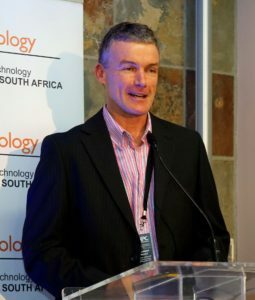 South African Department of Science and Technology Deputy Director-General Thomas Auf der Heyde described Sithole as a ‘Strategic Renaissance Man’ who is well-informed about the status of nations and the roles technology and data science play in socioeconomic development. In the Cape Town center’s early days, Sithole had already begun to build the technical infrastructure needed for South African researchers to engage with world-class technology, such as the Large Hadron Collider at the European Organization for Nuclear Research in Geneva, Switzerland (LHC-CERN). “LHC was the biggest game in town until the Square Kilometre Array (SKA) project was conceived. 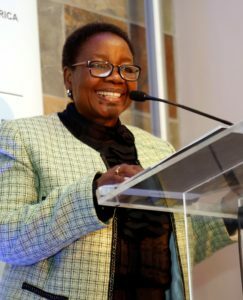 When others couldn’t imagine the implications for South Africa, Dr. Sithole envisioned the computational, data and human capital development that would be needed to support SKA’s 50-year lifespan. More importantly, he fostered the necessary relationships to support the investment,” said Auf der Heyde. When Sithole addressed the audience, he conveyed the importance of context and relevance when framing a case for a capital investment in HPC. 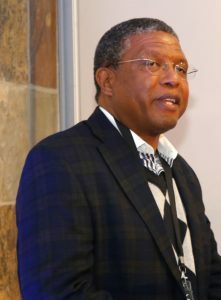 “Our research stakeholders were hoping for a larger system, but I advocated for one that I knew would fit CSIR’s budget and CHPC’s data center, while offering 15 times more processing power than our older system,” said Sithole. It’s a Dell! 1,039 Dell PowerEdge servers, based on Intel Xeon processors (19 racks of compute nodes); five petabytes of storage; and Dell Networking Ethernet switches w/Mellanox EDR InfiniBand interconnect speed of 56 GB/s. 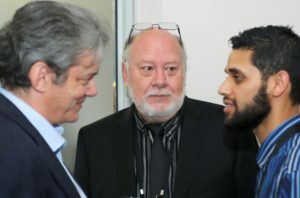 CHPC Research Manager Werner Janse van Rensburg introduced several researchers that have been using Lengau since it was launched for early-adoption in May. “In just a few short weeks, Lengau has already begun to enable scientific and engineering discoveries that will improve African economic empowerment, global public health and the quality of life for all,” he said. Computational Biologist Nicola Mulder’s group from the University of Cape Town’s Department of Infectious Disease and Molecular Medicine uses Lengau for next-generation sequencing data analysis. Sequencing Africa’s unique animals and plants for the agricultural biotech industry is becoming more feasible now that sequencing costs have dropped. Mulder’s team is genotyping data from full human genomes of African populations, and the South African National Bioinformatics Service Platform (BSP) is being developed to enable big data analysis. By facilitating access to unique African genomic data by a broader community of practice, BSP hopes to have a profound impact on global public health and food security outcomes. Lengau gives Mulder’s team a competitive edge since they can analyze data locally, and therefore produce results faster. “Until now, we ran our calculations on the Blue Waters system at the U.S. National Center for Supercomputing Applications. While Blue Waters is much faster than Lengau, the distance and data transfer processes added to the processing time,” she said. Simulations of how the climate is expected to respond to greenhouse gas concentrations are useful for a range of research applications. Predicting agricultural productivity, the availability of fresh water and how temperature affects public health are but a few examples. Until now, there hasn’t been an earth system model that was developed through an African lens. In collaboration with the Australian Commonwealth Scientific and Industrial Research Organization (CSIRO), Francois Engelbrecht and his team at the Natural Resources and Environment unit of CSIR’s department of Climate Studies, Modelling and Environmental Health are developing a Variable Resolution Earth System Model (VRESM) which will be used to make the first African-led contribution to the Coupled Model Intercomparison Project 6 (CMIP6) and Intergovernmental Panel on Climate Change (IPCC) Assessment Report 6 (AR6). Using an atmospheric model developed by CSIRO, Engelbrecht’s team produced the largest ensemble of climate simulations ever performed for the African continent with Lengau. The simulations were made for a 140-year period between 1961 and 2100 for low- and high-mitigation emission scenarios. 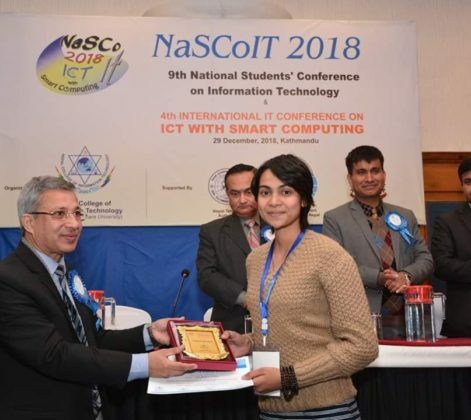 CHPC Senior Researcher Mary-Jane Bopape supports Engelbrecht’s team and helped them produce model simulations with 50km grid spacing of the globe, and high resolution simulations for grid spacings of 8 km and 1 km over Mozambique, Ethiopia, Egypt, Nigeria and Namibia. 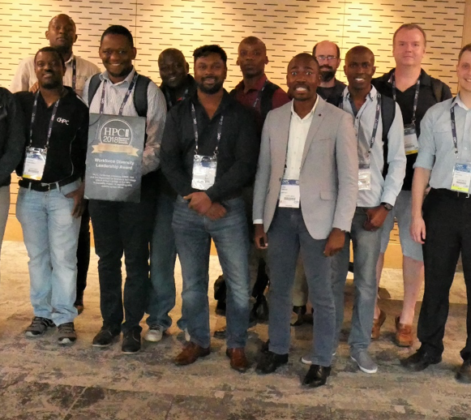 “It used to take three hours to create a detailed simulation for a one-month time frame using 96 processors, but it now takes less than 30 minutes on Lengau with 864 processors,” said Bopape. From the CSIR models, projected changes in mean rainfall, temperature and extreme events such as heat waves, flooding and droughts can be studied. “Our simulations will be used to influence global policy-making and best practices relating to CO2 emissions,” said Engelbrecht. South Africa’s Karoo desert will host instrumentation for the Square Kilometre Array (SKA)—destined to be the world’s largest radio telescope scheduled for full production in 2020. As described on the project website, SKA will be powerful enough to detect radio waves from objects that are millions or billions of light years away from Earth. It will operate over a range of frequencies and its size will make it 50 times more sensitive and up to 10,000 times faster (in terms of survey speed) than today’s best radio telescopes. Scientists will use the SKA to address fundamental questions that can only be resolved with a radio telescope, including how the Universe evolved, how stars and galaxies form and change and what “dark matter” really is. Most expect the SKA will enable discoveries that we can’t even imagine now. If there is life elsewhere in the Universe, it’s likely the SKA will hear it. 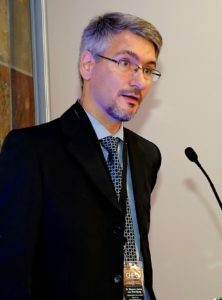 Jasper Horrell, SKA General Manager of Science Computing and Innovation, described how Lengau is positioned to fulfill SKA objectives. 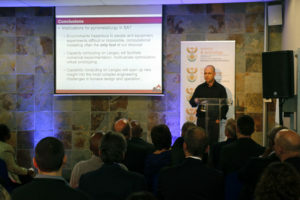 “It’s a big step up in computational resources for South Africa. Lengau will support parts of the scientific data analysis for the MeerKAT radio telescope, South Africa’s SKA precursor instrument which is coming online in the Northern Cape. 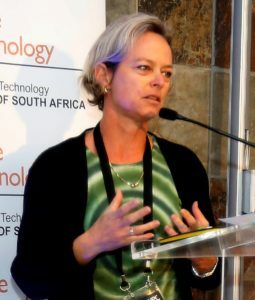 In addition, SKA, South Africa and CHPC are collaborating in a number of ways, including deployment of the MeerKAT archives at CHPC and efforts to develop an African data-intensive research cloud infrastructure with partners from the new Inter-University Institute for Data Intensive Astronomy (IDIA),” said Horrell. According to the Council for Geoscience, South Africa holds the world’s largest reserves of manganese and platinum, and among the largest deposits of chromite, vanadium and vermiculite. Consequently, South Africa hosts primary processing facilities for these natural resources, and on-ramps to global transportation routes that support commerce and growth for related industries. The addition of advanced cyberinfrastructure has therefore made South Africa the perfect laboratory for materials science and engineering innovation and discovery. University of Limpopo Computational Modelling Scientist Phuti Ngoepe and his associates, in collaboration with South African mining companies and experimental groups, use supercomputers to develop models of minerals that bear precious group metals. Their models help optimize reagents that extract minerals from such ores, or they could lead to the discovery of uncharted reefs. As the world’s energy demands transition from fossil fuels toward alternative sources, batteries are expected to gain prominence with transportation and electrical applications. Battery research requires mastery of computational physics, chemistry and materials science, and there’s a global competition to develop batteries that charge faster and last longer, while being smaller, safer and affordable to the masses. 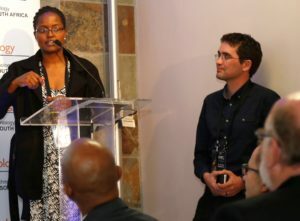 Ngoepe and U-Limpopo Research Scholar Sylvia Ledwaba explained how they use Lengau to develop simulations of synthesized complex structures that will help predict the performance of lithium battery electrodes. They are exploring a variety of materials—beyond lithium ion—which promise to be more powerful and smarter. Manganese, for example, is abundant in South Africa and widely used in battery cathodes. “Since related simulations are computationally-intensive, remote access to Lengau via SANReN’s high-speed network allows us to progress at a competitive pace from our Limpopo lab more than 1,700 kilometers away from Lengau,” said Ngoepe. “I can now produce more granular results between five and 19 times faster,” said Ledwaba. “Lengau is already living up to her name,” she added. CSIR acknowledges that when South African industries prosper, so do its citizens. Therefore, CHPC reserved 30 percent of Lengau computational cycles for private sector uptake, and Mintek is one of its first industry partners. Mintek is a leading provider of minerals processing and metallurgical engineering for a variety of technology products and industrial services. Located just outside of Johannesburg, it’s well-positioned to serve both academia and global commerce; its laboratories, pilot plants and workshops are proving grounds for science, technology and human capital development. While it might be difficult for some to envision a career in pyrometallurgy, it’s easier if you grow up in South Africa. Reynolds earned a baccalaureate degree in Chemical Engineering from the University of Kwa Zulu-Natal, a graduate degree in Applied Mathematics and Engineering from the University of Witwatersrand and a PhD in Applied Mathematics from the University of Cape Town. He explained how regional influences and opportunities shaped his academic path and career goals. Pyrometallurgy is a cool career, but it’s a lot cooler when you can determine the effects of extreme heat (2000K or 3140F) using a supercomputer instead of a furnace,” said Reynolds. Join us in East London for the 2016 CHPC National Meeting! We hope you will attend the 2016 CHPC National Meeting, and SADC HPC Forum December 5-9, 2016 in East London, South Africa. Plan extra time while visiting this beautiful region, and be sure to pack your hiking boots. It will be summer in South Africa, and you’ll find some of the best bird watching, fishing, swimming and horseback riding in the world. East London is South Africa’s only river port city. The nearby Wild Coast region has miles of pristine beaches framed by thick forests and steep, rocky cliffs. The area is rich in Xhosa tradition, and their farms are scattered along the coast. It’s sparsely-populated, so it’s likely you’ll meet more cows than people on the trails. With a favorable international currency exchange rate, you’ll only be limited your energy and time.